The brand of pet food products James Wellbeloved celebrates the love for the four-legged friends in a new touching advert. The 90-second animated spot, titled “Mega City”, features young Jack playing the guitar in a harsh corner of a street, in a big city full of skyscrapers. By his side, every single day, regardless of the weather, there is his faithful little dog, Harry, who helps him with the cap in which he collects coins from the passers-by. They use an old bike to move around and, as they get home late in the evening and throw themselves down onto the bed, after putting the coins in a jar, they look at a poster on the wall depicting a shiny, new bike. Apparently, Jack is saving money to buy one of those Starbeam bikes, but, when the spot comes to its end and the jar is full, we see that he changed his mind. 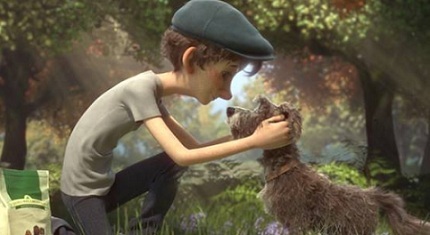 Eventually, Jack decides to move to the countryside and enjoy, together with his furry friend, nature. The latter steps faintly on the grass and bounds happily. His happiness grows even stronger when Jack feeds him with James Wellbeloved food and then they both set out in the field. The advert, featuring a cover of the 1975 single “Landslide” (originally by Fleetwood Mac, from their album of the same name), performed by Tim Dickinson, ends with the onscreen line “Love Well with James Wellbeloved Naturally Healty Pet Food”.